Support editing 4k videos shot by cameras, phones and other devices. Color Correction Tool for tuning up your videos. Over 300 effects at your choice. LG has launched so many 4K monitors into market with lots of incredible features that standout against all other competitors. You can find so many products that are designed specially to serve professionals for their editing needs but in case if you are searching for a gaming special monitor then LG 27UD68 is best for your needs. This monitor is designed with several advanced features and beautiful aesthetics. The very first thing that you need to know about LG 27UD68 series is that they come in two variants as LG 27UD68- P and LG 27UD68-W. The only difference represented by these two variants is color of these models where W stands for white and P stands for black. The article below contains detailed review about top features of these models, so keep reading before making investment. This monitor is loaded with AMD FreeSync technology. It has affordable price range. Professionals love its impressive color production abilities as it handles 99% accuracy with sRGB and 1.07 Billion Colours on screen. Contains DisplayPort 1.2a and HDMI 2.0 port. Highly rated for its outstanding aesthetics. Finally, you will get something without bezels from LG with this product and its sharp display edges make it more suitable for professional needs. It offers limited flexibility with its typical stand structure. You will not find any built in speakers with this monitor. It does not offer USB connectivity option. As most of the 4K monitors these days are designed with little bring aesthetics, LG 27UD68 is the best improvement over all those models. It’s elegant and eye catching appearance makes it worth buying and the pleasing features add more advantages. Its stylish build make it perfect choice for your desktop and the sleek metallic stand with silver look can handle this 27 inch display very well. The silver support leads to completely white back of monitor and five unique connectivity ports are placed perfectly in the inset panel. Note that, this stand with metallic appearance is not actually designed using metal rather it is made up of plastic. You will find very few options for adjustability as it can handle tilt and rotation only. The bezel free layout of this display unit appears quite attractive and the stunning picture quality complements it well. The anti glare coating of this monitor serves well for brightness and contrast by extending relaxation to eyes so that strain can be avoided. It also helps to improve efficiency of this 27 inch display with effective absorption of light. If we talk about connectivity options of LG 27UD68 then you will find them average with combination of good and bad features. 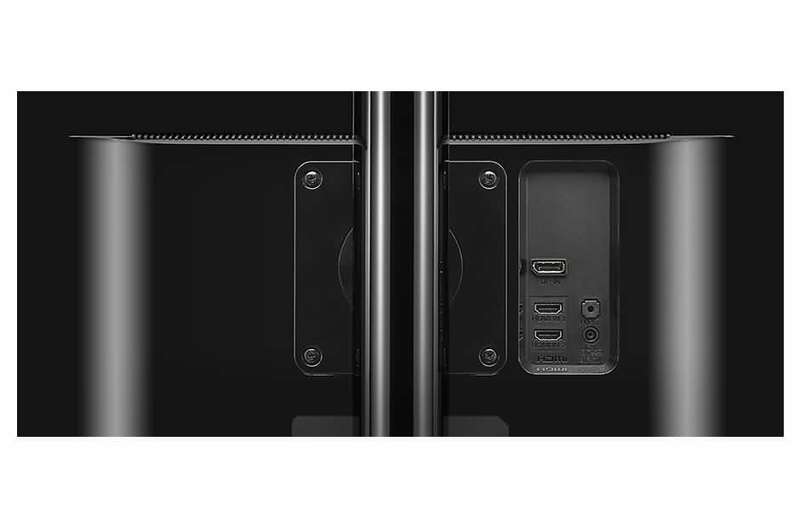 If you are a crazy gamer or are searching for a monitor that can handle multiple display screens at a time then you will be happy with its 3 unique display connections as one DisplayPort 1.2a and two HDMI 2.0 ports that handle 60Hz refresh rate for 4K transmission. They are designed to serve higher content quality with Adaptive Sync technology. But the sad part is that the USB port is missing in LG 27UD68-W. Most of professionals will rate this monitor down due to absence of the USB 3.0 port. You must be curious to know about accessories that are included in this 4K monitor package. It contains one user manual with detailed instruction set, a 4K capable display board cable, HDMI chord, a sturdy stand and one power cord. The overall dimension of LG 27UD68 is 24.2 by 7.2 by 17.9 inches. There are three different gaming special presets in LG 27UD68 model that can be selected with the help of exclusive control software available on screen or the OSD’s joystick. You will find two presets for handling FPS games where one works for RTS games and the second one is Custom mode that can be adjusted by user as per their desired project needs and can be easily saved for future needs. These dedicated presets are highly optimized for gaming needs because they help to activate Dynamic Action Sync ability and black stabilizer that can drastically improve performance for gameplay. Other than these gaming presets, you will also find few standard picture presets on this monitor. The range of include Standard mode color weakness, sRGB, photo, Cinema and Reader mode. In case if you spend more time on your computer then it is good to switch to reader mode because that can handle blue light appearance in much better manner to keep your eyes relaxed all the time. If we talk about color performance of this 27 inch monitor then you will find it stunning enough with 3840 by 2160 resolution level. The best part is that this monitor helps to distribute colours very well on complete screen, even at edges and the sharpness of content is definitely appealing. This affordable monitor handles sRGB with 99% color gamut response and color depth is rated to be 10 bit. It handles aspect ratio of 16: 9 and manufacturers have perfectly adjusted 8.3 million pixels on this 27 inch screen. As compared to HD monitors, LG 27UD68 appears almost four times better with much sharper details. You will be glad to know that this 27 inch monitor can handle millions of colours while ensuring stunning sharpness. The 5ms gray to gray response of this monitor helps to handle stuttering and tearing issue very well. This response time along with wider screen size makes this monitor perfect choice for gamers; you can prefer to couple 60Hz refresh rate with 1440p resolution level. For some of you this value may appear small but actually it does not create any trouble till the time you go for high end games. The remaining gaming issues are well handled with its AMD FreeSync technology and synchronization is well maintained with higher frame rates that removes tearing issue very well. The super high quality of this display unit balances all media clips and movies very well. You will never find any issue related to itching and fatigue on this screen and the IPS technology further handles wide viewing angles very well without causing any bleeding on edges. Colours on this display module appear well even with factory calibration and it also improves delivery for peak brightness, contrast and black levels. The higher color accuracy makes this monitor suitable for almost all professional applications. Black Stabilizer: It helps to adjust black levels very well on monitor screen so that users can enjoy clear, sharp and bright image for all media files as well as for games, even when game mode takes players to darker areas. In such situations, the dark backgrounds naturally go brightened and sharpened without altering content quality; it helps gamers to find their enemies with ease even at dark places. This addition of black stabilizer technology is really good for all professionals. On Screen Controls: In order to make all settings and controls easier for users, LG 27UD68 allows easy access to all preferred settings via desktop application so you need not to mess with OSD joystick. However, this joystick is much easier to operate and allows easy navigation for different features. With this specially designed software, it is much easier to adjust all essential settings like sharpness, gamma, volume, contrast and brightness with extended controls to presets and screen split feature. All these parameters help to improve viewing experience for this IPS panel. Dual Controller: With this dual control ability, you will find it much easier to connect two computers together. Users simply need to install this dedicated software and rest all controls appear interactive enough. Once you switch to Pic by Pic mode then it will immediately connect two PCs simultaneously and users can easily swap between two different screens to handle various operations with keyboard shortcuts and mouse movements. It is also much easier to transfer media files between two systems and this task can be completed with just two clicks. Note that this transfer process can handle files up to 2GB at max. Screen Split Feature: It is possible to split desktop screen into two or four portions so that several things can be handled on same screen simultaneously. It offers 14 unique options for easy selection so that multi tasking professionals can find everything much easier. Just a few mouse clicks are capable enough to adjust several balanced display sections on screen with aspect ratio of 16:5 and 4 unique Pic in Pic modes. These features assist professional photographers and videographers to manage all editing tasks with ease as spacious screen can be well organized and one can swap between applications with few clicks. This 27 inch PC is not only recommended for professional graphic designers but at the same time it serves well the needs of all gamers. As, response time of this gaming monitor goes up to 5ms that is best for most of 4K and 1440p gamers. Further, it has ability to handle 60Hz refresh rate that ensures smooth frame processing on display screens. 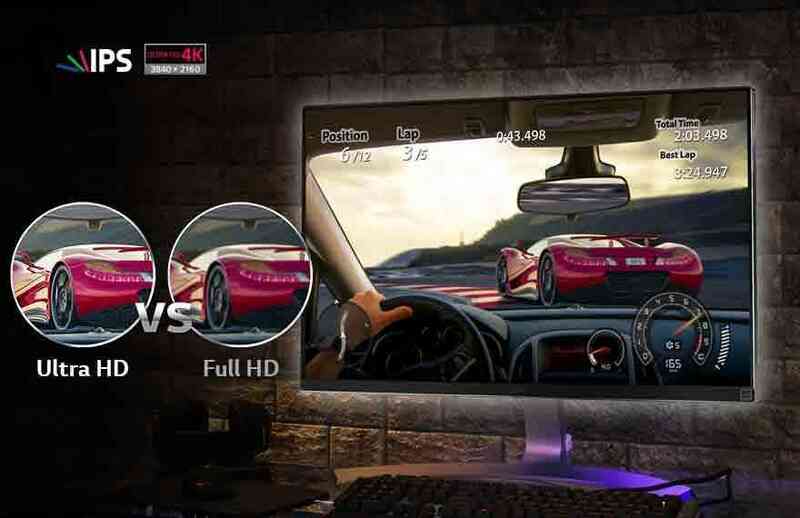 All the remaining issues are well handled with addition of AMD FreeSync technology so that viewers and gamers can enjoy smooth as well as robust processing for all their professional needs. The DisplayPort 1.2 is added to make this monitor suitable for 4K UHD gaming experience where fast graphic card can ensure high quality content with much smoother details. All features of this affordable gaming monitor makes it standout against all popular competitors and supportive stand helps to manage view at desired eye level. After going through all these incredible features of LG 27UD68 27 inch monitor, professionals prefer to recommend this unit to for studios, offices and home based needs. Some of the top rated features include impressive brightness, immersive color performance and stunning contrast level. All these decent collections of specifications and up to date connectivity options improve performance of this display monitor. Although, it lacks somewhere in adjustability options but rest all performance specifications make it a must buy product. This attractive display unit is well designed for professional graphic editors and gamers. You will definitely love to appreciate its rich image display, quick response time, and advanced gaming presets that promise delivery of outstanding gaming content. The screen organization ability is improved with split screen feature as they can be handled with easy screen swapping functionality. This affordable unit is simply best choice if you want to enjoy crisp and deep details for your movie hours and the multi display type setup option make it perfect choice for editors. The VESA mount ability and impressive viewing angle ranges allows users to hang up this monitor on wall without losing the content delivery. Prefer to use high quality AMD graphic cards to take real benefit from FreeSync technology and rest all issues will be handled with faster refresh rates and quick response time.